At the National Gallery, London, the gorgious Degas from the Burrell Collection now on view. Should we really present Glasgow's Burrell collection? You can see the works of Degas who are currently composing it at the National Gallery in London, a documented exhibition of a catalog that does her credit. Of the 22 Degas works donated by William Burrell to the Glasgow Museum in 1944, there are 10 paintings and 12 pastels and drawings of irreproachable quality. As Vivien Hamilton, curator of the exhibition and curator of the collection in Glasgow, explains in essence, the art history of this period is strongly marked by the link between Degas and Burrell, by the passion of the second for the first. Coming from an industrial family, Burrell and his brother make their fortune in the merchant marine and take advantage of the great economic depressions to buy fleets at low prices and then resell them upward. Rich! Burrell's fortune can't be compared to those of J.P.Morgan, William Hearst and Paul Mellon in the United States. This didn't prevent him from buying with taste and discernment the works that will constitute his collection. It is thanks to his insight that Burrell will choose the Degas of the best taste, especially dancers, sometimes scenes of horses, rarely bathers. The great artistic activity of the United Kingdom, London, Edinburgh and Glasgow at that time will attract the attention of William Burrell. He went to the International Fair in Edinburgh in 1886, to those in Glasgow in 1888 and 1901. He was caught up in the whirlwind of Impressionism and became passionate about Degas. On this way, he finds commercial assets such as Alex Ried, which will undoubtedly be at the basis of the development of the art market in Great Britain. Thus, he founded the Société des Beaux-Arts, Glasgow's first big gallery. Many other galleries, no doubt as active as Knoedler and Durand-Ruel in the United States and France, will develop the Impressionism market in the Channel. Among other items in the exhibition catalog, Vivien Hamilton recounts with rigor and insight the fascinating history of painting at this time and the great collector William Burrell. The works we can currently see in London reflect the exquisite taste of William Burrell. No doubt they will convince you. 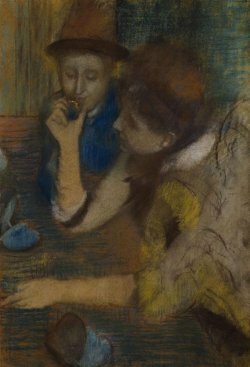 Some of the Degas from the Burrell Collection will be on view at Marseille, musée Cantini, from May 18 to September 23, 2018 at the exhibition Burrell's Realistic and Impressionist Masterpieces.